This month we’re building up a Membership Website. Not only can you follow along as we build this business from the ground up, you can also become a founding member for just $1! So far we’ve created an entire membership website; with accompanying sales funnel, submitted our first solo ad order as well as created our first Facebook Targeting & Retargeting Ads. And today, I want to reveal “7 Success Principles” that will supercharge your business. Who else wants to build a profitable online business and enjoy wealth, freedom and overwhelming happiness? In under a week, you could be an actual business owner. 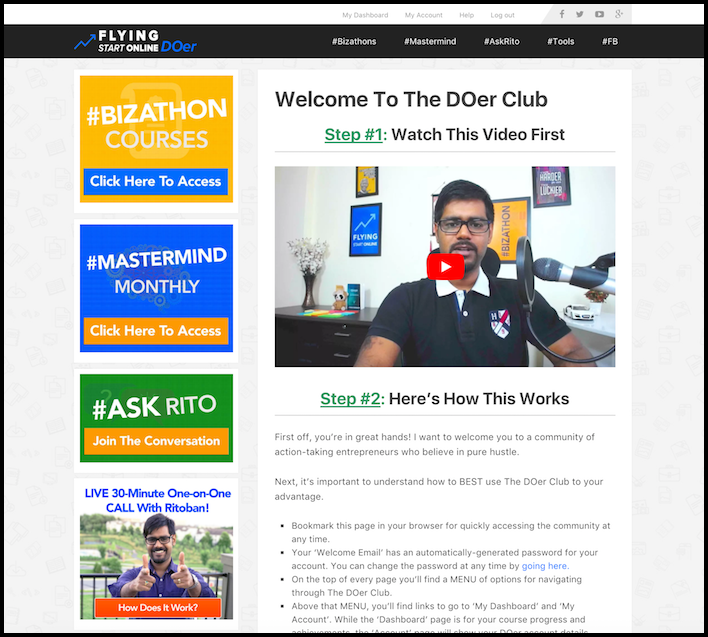 Thanks to Rito & The DOer Club which has already helped several people achieve financial independence! Are you struggling with information overload? Would you like to learn how to create an online business but don’t know where to start? The DOer Club was created by a professional entrepreneur who specializes in helping people like you. Overcome the monotonous cycle of the rat race, learn how to build digital assets, enjoy passive income, and achieve true independence. Two minds are always better than one. Masterminds often occur with other great minds in your industry or with a coach working 1 on 1. Anyone can benefit from working with a coach. Asking for help to achieve a goal is NOT a sign of weakness! In fact, getting insight, a fresh perspective, and motivation from an impartial observer can be just what you need to find a new way to tackle a problem you’ve been having trouble overcoming. It’s no coincidence that a high percentage of the world’s most successful people – from elite athletes to captains of industry – credit their success to help from their coaches. Rito has been helping people overcome various business blocking obstacles for the past 10 years! He first decided to become a professional marketer in 2007, after becoming fed up with the same dead-end routine as so many of his peers. Since then, he’s undergone rigorous trainings, creating a number of successful online businesses. Meet actual clients who have already created a successful business with The DOer Club. During these past 10 years, Rito has had the pleasure of working with over 25,000 clients, helping them overcome MANY of the hurdles preventing them from achieving true success. His clients come from varying backgrounds, and have a multitude of educational, career, and life experiences. But the one thing they have in common is the desire to overcome the problems holding them back, and enjoy greater levels of success, and all the rewards that come with it. 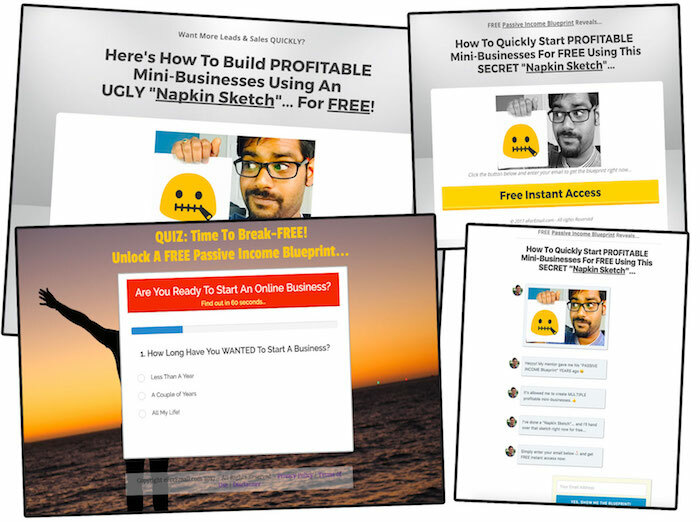 Here are case studies of just a few of the many people he’s helped to create 5-figure affiliate sites, 6-figure SaaS companies and 7-figure product launches. When you work with us, together we’ll overcome ANY obstacles standing in your way of enjoying passive income, financial freedom, and self satisfaction. Over the years, we’ve developed a highly effective process for working with clients that allows us to make the maximum progress in the shortest amount of time possible. Rito’s a one man powerhouse: meaning he designs, codes, writes copy, creates funnels, runs ads, and pretty much everything else. You get to witness him in action every month as he builds a NEW online business from SCRATCH in the Bizathon challenges. And if you miss any sessions we laid them out in ACTIONABLE, Step-by-step Courses you can consume at your own pace. You literally end up building your own business with us every month. He’s like a scientist dissecting their brains – experimenting with many business strategies. If you’ve got a question you will get an ANSWER. You literally have NO excuses anymore. This is it! Imagine a room where every single person is building the same business as you – in multiple niches, a community of action takers helping each other out, critiquing each other’s progress and extending their arm when a fellow DOer is stuck somewhere – INCLUDING Rito & Myself! You will absolutely LOVE these if you’re not a techno geek! We believe in simplifying and automating as many parts of the business as possible. So while Rito will be recommending additional tools you may need – He’ll only recommend the ones he ACTUALLY uses and loves; He will also be building new nifty tools and softwares that we’ll be using in the Bizathons and we will hand them over to you. We’ll enable you to network with the brightest and smartest minds in online entrepreneurship. Rito has opened up access to a Bonus Private Facebook Group where you can interact with DOers, share your progress and level up. We’re all about getting little wins and scaling together! With Rito working by your side, helping to keep you focused and motivated, suggesting new approaches to common problems, and acting as a “sounding board” for your ideas, you can’t help but reach your goals. Can You Afford NOT To Work With Us? What’s it costing you – in terms of stress, anxiety, and frustration – to continue struggling, and always come up short? And consider the real financial costs of your inability to reach financial independence, like the cost of coding a website from the ground up, or the toll of essentially being owned by your employer. Like starting your own business and building high converting sales funnels – that working with a qualified coach and supportive community can bring! Become a founding member of The DOer Club – Today! Are you going to continue to struggle, never quite achieving the goals you’ve set for yourself, and always feeling like you’ve failed? Will you continue to pay the price – both financially and emotionally – which comes with never accomplishing what you most want to do? Or are you ready to work with us, so that together, we can find a way to create a successful online business, and you enjoy Wealth, Freedom and Overwhelming Happiness? The decision is yours — but I think you’ll agree the choice is clear. Join now for your $1, no-obligation membership. Sign Up For $1 Now! But please hurry… I only have room for limited new clients at this “Founders” price, and spots will fill up quickly. That’s a wrap for Day 24 – Well done! As always, if you have Questions, Comments or just want to say Hi? Please do so in the comments section below. P.S. You’ve got NOTHING to risk by getting in touch to see if our membership could benefit you. Our no-obligation membership is 100% Refundable. That’s right, if you’re not blown away by the level of care and attention put into your business success, we’ll give your dollar back.